Tape Talk: It's a Sticky Business!! 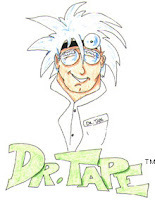 Welcome to Tape Talk brought to you by TAPE-RITE, "The Specialist in Speciality Tapes." 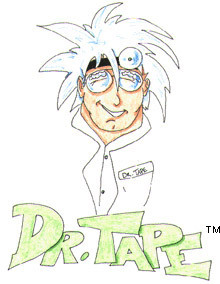 I am Dr. Tape, the world's leading authority on adhesive tapes. In this series of blogs, I hope to unravel the mysteries of adhesive tapes. TAPE-RITE was founded in 1952 by Irwin "the Tape Meister" Machover. This makes us one of the oldest (and largest) tape converters in the USA. Over the years we earned a reputation of having hard to find tapes on the shelf in any size required. Today, TAPE-RITE is run by a second generation of Machovers- Andy and Geoff. When we were young, our father instilled his love of tape in us by having us come in on weekends and holidays to sort and pack tape (at slave wages I might add). But his foresight paid off. Today, we continue our tradition of high quality, wide selection, large inventory and competitive prices so you can get the tape you want when you need it. Today's adhesive tapes are highly specialized formulations designed for superior performance across a wide range of applications. This does not mean that every tape works in every application! Your choice of tape will depend on a wide variety of factors, including location, environment, life cycle of finished product and other influences. The more information you can provide about your application, the easier it is for us to get you the right tape for your job. A good example of this is plastics. There are hundreds of different plastics in use today. Many of them have surface characteristics that make it difficult to stick to them. The use of the wrong tape on one of these plastics will result in adhesive failure and will compromise the integrity of your finished product. By identifying the type of plastic you are using, we can avoid this. The same holds true for certain papers, painted surfaces, and metal finishes. Never assume that any tape will just work unless it's designed for the application! Down the road, we will be looking at specific tapes and their uses. If you have any questions, please feel free to contact us and we will be glad to help you. Until next time, remember, IT'S A STICKY BUSINESS! The Wonders of ATG Tape!